Some of the best things I’ve seen at the Theatre at Boston Court in Pasadena have been subtle psychological introspections – puzzles only solved as you delve into the storyteller’s world. This is often greatly enhanced by the daring with which Boston Court’s directors and designers approach the telling of the tale: the understated symbolism, and little hints of the power behind what the words are saying, etc. 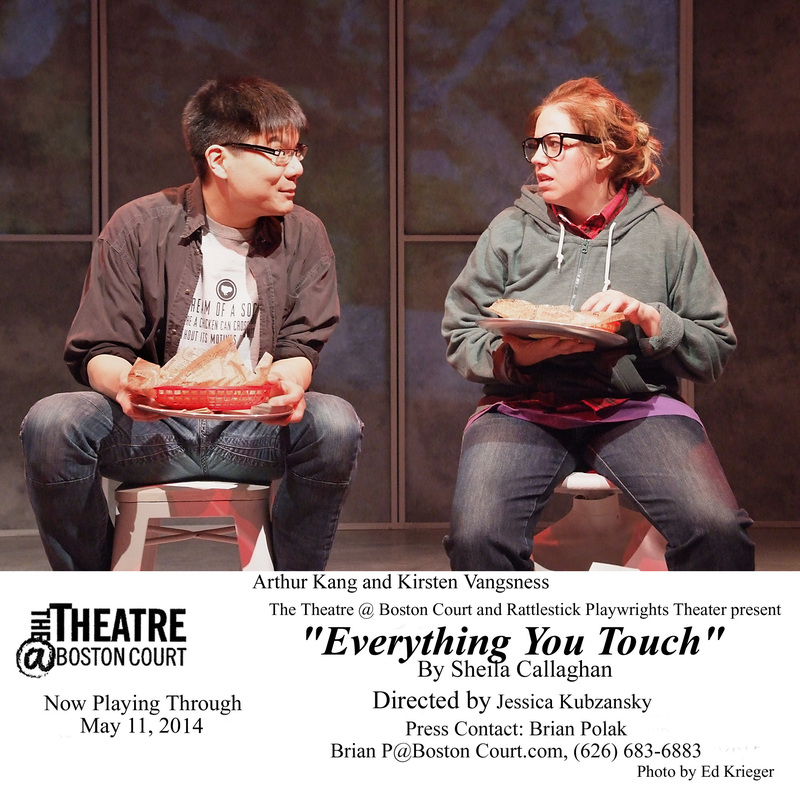 Case in point would be “Everything You Touch” by Sheila Callaghan, a coproduction with the Rattlestick Playwrights Theater which was nurtured into being by the Boston Court, and is receiving its world premiere run there. And who better to direct something steeped in the above-mentioned subtleties than co-Artistic Director Jessica Kubzansky. The results have proved so fascinating the run of the play has been extended until at least May 18. “Everything You Touch” is grounded in the world of fashion. It centers on parallel plots. One is set in the 70s, following a self absorbed fashion designer’s gradual shift from outlandish and groundbreaking to popular and trendy – and the women who inspired the two versions of himself. The other, seated in the now, seems a polar opposite: a dumpy and disheveled young computer whiz whose wrestles with the demons of her own self-loathing escalate as she must travel from New York to Little Rock and her dying, judgmental mother. At least, that’s where it all begins. From there the two stories weave in and around each other, creating some questions, answering others, blurring lines in time and space. To add to the surreal, the set dressing and props consist rather heavily of live fashion models. They stride in, angle themselves, and become computer screens, telephones, gum dispensers, and all matter of props. What isn’t made of humans – a chair is the most startling example – is made of mannequin parts. In short, fashion consumes the set just as it powers the plot. If this sounds convoluted, it’s not. Both Kubzansky’s direction and a spirited, richly expressive cast easily pull the audience into the puzzle. Tyler Pierce is Victor, a womanizing fashion designer with a struggling boutique and a reputation for both callousness and an edgy, out-there creativity. Kate Maher gives her own sharpness to the former model who has become Victor’s artistic muse and occasional sexual partner. Amy French is the comparatively cornfed prize winner whose visit and discourse on comfiness strikes a surprising bell with Victor, initiating a sea change in all his relationships. Kirsten Vangsness is Jess, the frumpy computer geek used to one-night stands and a life behind a computer screen. Her somewhat sarcastic sense of self leads her to meaningless relationships, all the while ignoring her work partner, Lewis (Arthur Keng), whose devotion she cannot see. Now she hears her mother is dying, and scoops up a guy – essentially an elongated pick-up – to go with her on the journey. Or does she? The achingly white set by Francois-Pierre Couture, ingeniously crafted to allow for quick changes and a focus on the colorful clothing, Jenny Foldenauer’s startling, varied and very telling costumes, Adam Flemming’s evocative projections, John Zalewski’s original music, and those weird and wonderful props by John Burton all combine to guide the audience through the characters’ interior monologues and human conflicts. In the end, what appears just to be a conversation on self-image has much more to say about the human spirit and the nature of both success and art. “Everything You Touch” delivers that remarkable combination of satisfaction and conversation starter that makes for one kind of excellent theater. And since shows that make you think are The Theatre at Boston Court’s bread and butter, it is no surprise that the show is being held over. The special efforts it took to make this world premiere happen certainly prove to be worth it. As I – and many others – so often say, one of the most fascinating things about seeing new productions of Shakespeare’s plays comes from the very familiarity of the works themselves. Directors do not feel, as a rather staid British friend once claimed, that all the Bard’s plays must be performed in doublet and hose. Far from it. Doing Shakespeare is a license to be extraordinarily creative. His works’ longevity, in truth, comes largely from three things which transcend time: complex characters, universally human themes, and rich, gorgeous, profoundly expressive language. These are elements one can gleefully, well, play with. Which brings me to the much-honored Jessica Kubzansky, co-artistic director of The Theatre at Boston Court in Pasadena, and self-proclaimed Shakespeare freak. In love with the comparatively obscure history play, “Richard II” – a fount of rich, introspective poetry on the subject of increasing self-awareness – she decided to rework the thing. By losing the host of extraneous historical personages, she has honed the play down to the meat of the tale: a man left immature and selfish by his upbringing who is brought to full understanding of adulthood by the disaster his acts bring upon himself. And thus, “R II”. Kubzansky has reedited the play into a series of flashbacks, as the doomed Richard ponders his fate and what brought him there. And she has honed the cast of 33 named persons and assorted underlings down to three individuals. One plays Richard. The other two play the 12 other people essential to the plot. Some necessary dialogue from others has been handed to the 12, some to Richard. Stripped of its finery and its crowds, this intimate piece becomes an extraordinary celebration of those very things mentioned above: character, humanity, and articulate speech. Then she has set the thing in Kaitlyn Pietras’ minimalist, yet surprisingly evocative set, with projections of essential lines of dialogue occasionally pounding the back of the room as sound designer John Zalewski’s whispering crowds mutter in your ear. Jenny Foldenauer’s all-purpose black costumes, festooned now and again with just enough to create individual personages, allow for quick character shifts and – as does everything else – divorces the audience from the drapery and pomp of an ordinary production of one of the history plays. All attention is therefore on the essentials: the king. John Sloan creates a Richard who shifts over the course of the production from callow youth to an achingly doomed wisdom, yet remains essentially ordinary – less than imposing even in an ornate crown. He is never really offstage during the entire two hours or so of the production, and his commanding use of Shakespearean dialogue in the process of Richard’s gradual metamorphosis keeps the show alive. Paige Lindsey White, playing five parts but most particularly Richard’s nemesis Henry of Bolingbroke, and Richard’s Queen Isabel, commands varieties of body language and vocal tone to shift us from character to character with a conviction which carries the audience with her quite seamlessly. Beyond that, she manages to imbue these very differing people with their own rounded passions, drives and griefs. Fascinating to watch. Likewise Jim Ortlieb is called upon to create a total of seven persons, all of whom are fairly elemental to the storyline. Ortlieb is at his best when operating outside Richard’s family circle, either as Thomas Mowbray startled at the king’s double-dealing, as the fascinatingly spun John Bushy whose portrayal colors the entire production, or the Bishop of Carlisle stuck between history and doctrine. On the other hand, perhaps the one weakness of this startlingly good production (and it is more an issue with the script than this performer) comes as Ortlieb is asked to keep various of Richard’s kin separate, all of whom come from the same rank, concern, and general attitude. 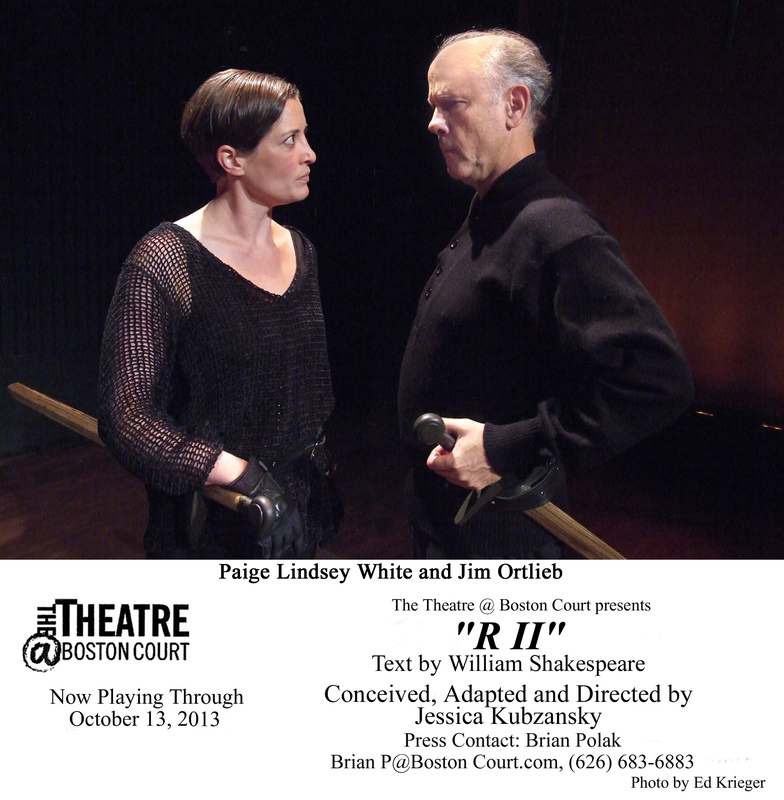 Still, that takes little away from “R II.” The poetry – some of Shakespeare’s best – is retained. I admit Richard’s speech in defeat, “let us sit upon the ground and tell sad stories of the death of kings…” is one of my favorite, if one of the gentlest of the Bard’s poetic lines. Here it stands out more than usual because of the focus on Richard alone. 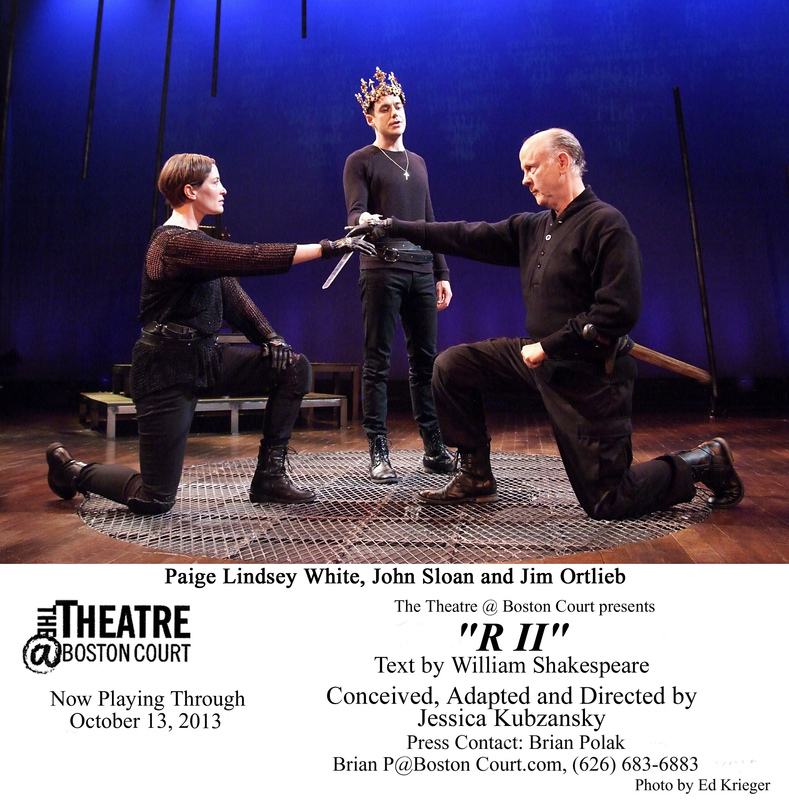 If Shakespeare intrigues you, and particularly if you have never met “Richard II” onstage, this is one to see. I love a good puzzle. I love a play which begins with what we know overtly and then turns that reality upon its head. It can make for edge-of-the-seat watching, if handled right. If not, it can become an exhausting exercise. At The Theatre at Boston Court, the puzzle is a pleasure. 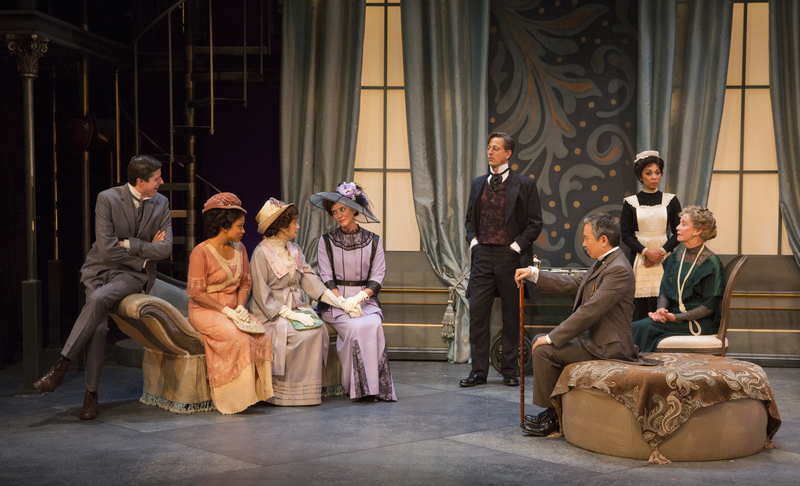 There, Michael Elyanow’s world premiere play “The Children” takes a spin on classical theatrical literature and warps it into a modern setting with surprising, fascinating and deeply satisfying results. Perhaps this comes from the organic nature of the puzzle itself, told by creating characters the audience connects with and an emotional palate which resonates regardless of antiquity, the anomalies which make the puzzle work, or even the fact that two of the protagonists are puppets interacting easily with the humans around them. The initial premise is a fun anchor. What if, in the ancient Greek story of “Medea,” a handmaid equipped with some of Medea’s magic managed to swoop the children who would otherwise have been murdered into a different time: say a fishing lodge in 21st century Maine? What if, along with those three, Medea’s very faithful slave – the children’s nurse – also was swept accidentally into the present with the intent of returning the children to their fate? What would happen if they were then faced with explaining themselves to the conscientious sheriff intent on moving them to safety as a huge storm approaches? Sonny Valicenti and Paige Lindsey White handle the brother and sister puppets, allowing them an intricate interaction with their human costars that becomes so effortless one forgets every once in a while that they are not real. Indeed, the two puppeteers turn out to be far more personally engaging, and far more connected to their animated selves, but that is another part of the puzzle. Adriana Sevahn Nichols, as the more benign rescuer, finds her own balance of practicality, incongruity and nurture as her character stumbles over the time change and the incongruities which develop. As the far more passionate, and intractable nursemaid, Jacqueline Wright vibrates with an underlying ferocity required of a character at once loyal and edgy. Daniel Blinkoff’s philosophical and somewhat ineffective sheriff spreads a kind of calm over even the more desperate moments of the story. Together they are absolutely riveting. This comes courtesy of the tight and insightful direction of Jessica Kubzansky, who knows just how much to play with the audience and when to make the whole piece feel very straightforward. Add to this Francois-Pierre Couture’s layered set, which he and Kubzansky have filled with subtle clues, and with the layered but heartening script itself, and youhave quite an evening. This kind of twisting, visual storytelling is the very stuff of theater. Puppets are real. Medea’s children can land in Maine – or do they? In the end, it’s a puzzle you must solve for yourself, and it is genuinely worth the effort.